The Best Potato Salad = Simple, Tasty Ingredients. So, What Goes in Potato Salad? What makes for the best potato salad? Simple, tasty ingredients. Nothing complicated and I like that. This recipe is like a classic potato salad amped up. It has a few extra ingredients than you may normally find, but nothing complicated and probably ingredients you already have on hand. I always say that good food doesn’t have to be complicated, just tasty. 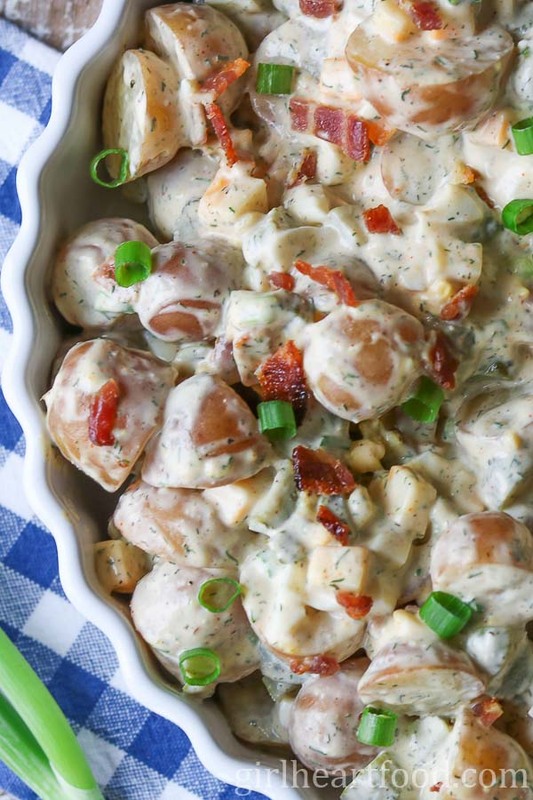 Once you make this easy potato salad recipe, there’s no going back – it’ll be your go-to! What’s the Best Potato for Potato Salad? I love to use red baby potatoes for homemade potato salad. They have thin skins and are not too starchy. And because they are thin-skinned, I always love to leave the skin on (actually, usually for all potato recipes I do that). I enjoy the little bit of texture its gives. Just make sure the potatoes are scrubbed clean and picked over before using. 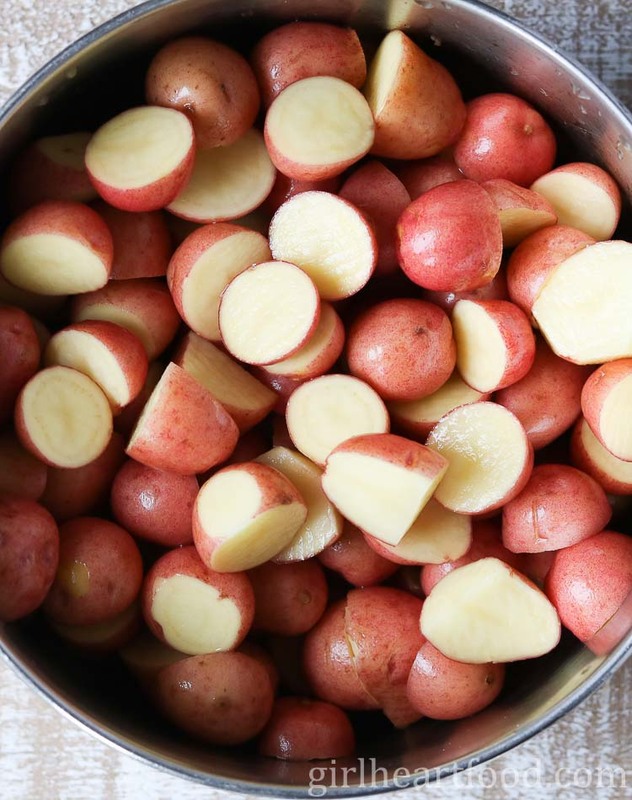 Another reason why I love using baby red potatoes in this salad is because when they are boiled, they retain their shape well, which is exactly what you want when making a chunky potato salad. Nobody want mushy, broken up tatos, do they? Red potato salad – yep! That’s the way to go! 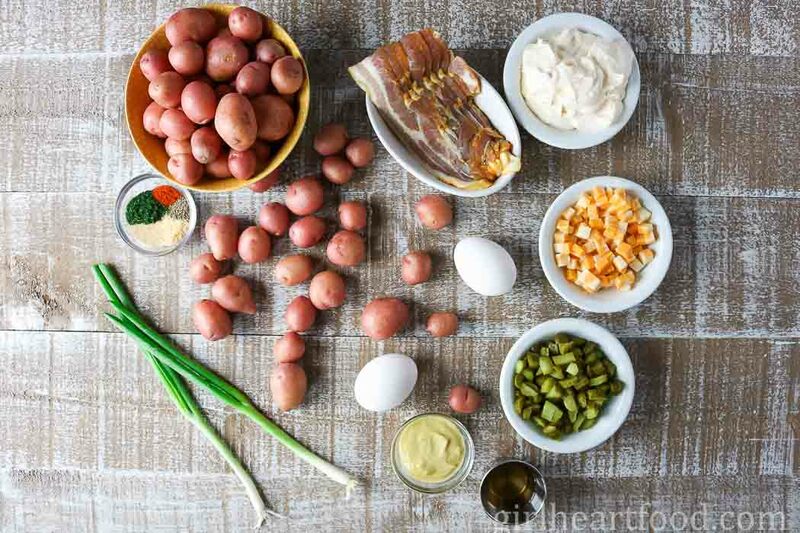 Though I am using ‘baby’ red potatoes in this potato salad, I do cut some of them, depending on their size. Like with any produce, there are variations in size, with some potatoes being smaller or larger. The larger ones I cut into chunks, the itsy bitsy ones, I left whole. Just make sure that they are bite-sized and all about the same so that when the potatoes cook, they cook evenly. Boil clean, cut, red baby potatoes. Drain, rinse, dry. Drizzle over dill infused dressing and stir to combine. Garnish with extra bacon and green onion, if desired. Can You Make Potato Salad the Day Before? Does Potato Salad Need to Be Refrigerated? Yes and yes! Just store in the fridge, covered. I made this salad the day before a family get together and it tasted just as good the next day as it did the day of. How Long Does Potato Salad Last? This salad is best enjoyed within 3-4 days, though, I don’t think that will be a problem – after all, this is the best potato salad recipe 😉 After that, toss it. Red baby potatoes are the best choice in this salad. If you can’t find or don’t have baby potatoes, no worries! Just use the regular sized ones and cut into bite-sized pieces. Don’t overcook your potatoes. Start with a pot of cold water, add potatoes, bring to a boil, salt and cook for 8-10 minutes or until fork tender. If they are overcooked, it will be too mushy and nobody wants that! After the potatoes are cooked, I always drain and rinse with cold water. I then place on a tea towel lined baking sheet and allow the potatoes to dry out a little before adding the rest of the salad ingredients and dressing. If you want your salad less or more ‘wet’ from the dressing, then simply omit or add mayo, about a tablespoon or so at a time until you’ve reached your desired consistency. It’s always easier to add than to take away. I always like to reserve a little bacon and green onion for garnish to give this potato salad a pop of colour. Want this potato salad to be straight up vegetarian? Just omit the bacon. Next time when you’re asked to take a dish to a potluck or bbq this recipe will be your go-to. I know it’s mine! Don’t ya just want to grab that lil’ tato from your screen? What Goes with Potato Salad? To all my fellow Canadian friends who will be celebrating Canada Day on July 1st, HAPPY CANADA DAY!!! Hope it’s filled with fun, friends and good eats! Looking for an awesome salad to bring to a summer bbq party? Look no further! This one is the best potato salad, if you ask me! Chunks of baby red potato are mixed with loads of crispy bacon, crunchy pickle, cheese, chopped egg and a few other ingredients. This delicious red potato salad is then tossed in a creamy mixture made with mayo, Dijon mustard, cider vinegar and dill. So good! In a medium pot, fill with cold water. Add potatoes. Bring to a boil, season water with salt (about 1/2 tsp). Cover with lid slightly ajar and cook 8-10 minutes, or until potatoes are just fork tender. Drain, rinse with a little cold water and drain again. Place on a tea towel lined bacon sheet to dry out a little. Note - you can cook eggs with the potatoes if you wish. Otherwise cook them separately until they are hard boiled. Meanwhile, place bacon on a sheet pan (in 375F oven) and bake 15-20 minutes until crispy. Drain on brown paper towel. 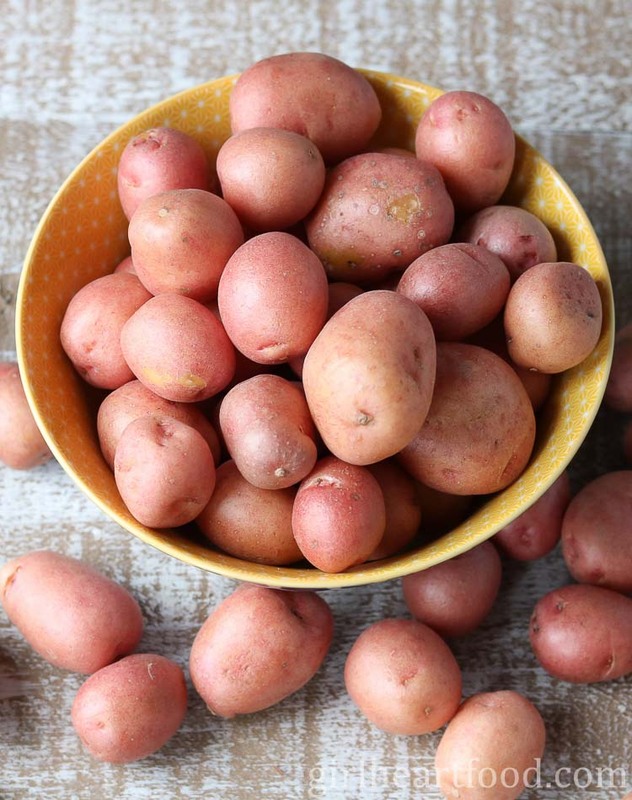 Place cooked potatoes in a large bowl. Add cooked chopped eggs, crumbled bacon, pickle, cheese and green onion. If desired, reserve a little green onion and bacon for garnish (optional). Mix together mayo, Dijon mustard, cider vinegar, dill, salt, pepper, cayenne, onion and garlic powder. Pour over potato mixture and mix to combine. Garnish with green onion and bacon, if desired. Enjoy! I can’t have barbecue without having potato salad and yours sounds terrific. It reminds me of a loaded baked potato. I have to say that whenever I see “the best X ever,” I usually think, uh huh. But wow, this does look like the best potato salad ever! I love eggs in potato salad. But BACON? Yes, please! And pickles, and cheese … I’ve never had a potato salad with all those things, and now I have to have it! Hahaha – understandable 😉 Thanks so much, Jeff!! It really is quite tasty…hope you get a chance to try this one out! Mmm, LOVE potato salad in the summertime! I especially love the addition of dill pickles – my absolutely fav! Me too! Thank you Jessica! They really add a nice crunch, don’t they 😉 ? Potato salads are always a must at BBQs! I usually make a mashed version loaded with mayo and coleslaw dressing because that’s what the family likes! But I love this chunky version. 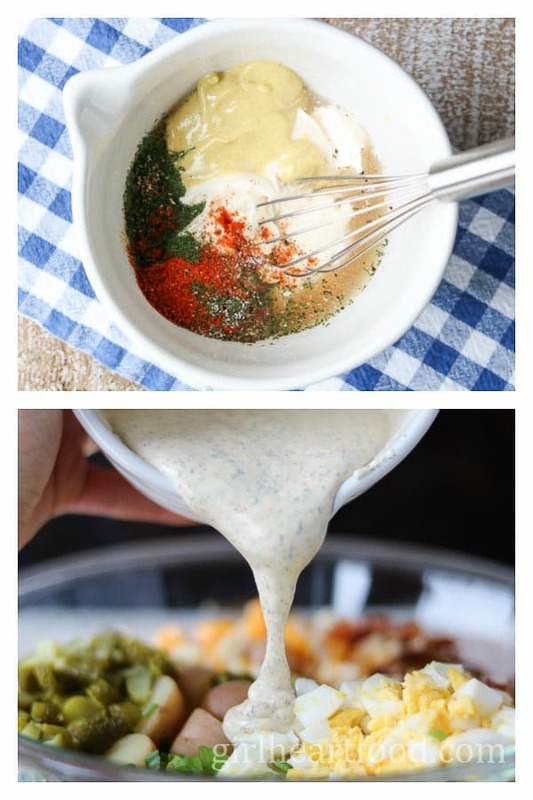 I can’t eat mayo, but I would love to try this recipe with sour cream or greek yogurt! Oh my goodness.. the hubs devours potato salad, and I’ve never actually made it! I need to make him a batch of yours- it looks so much better than store-bought! I could eat the entire bowl myself. Perfect for the holiday! 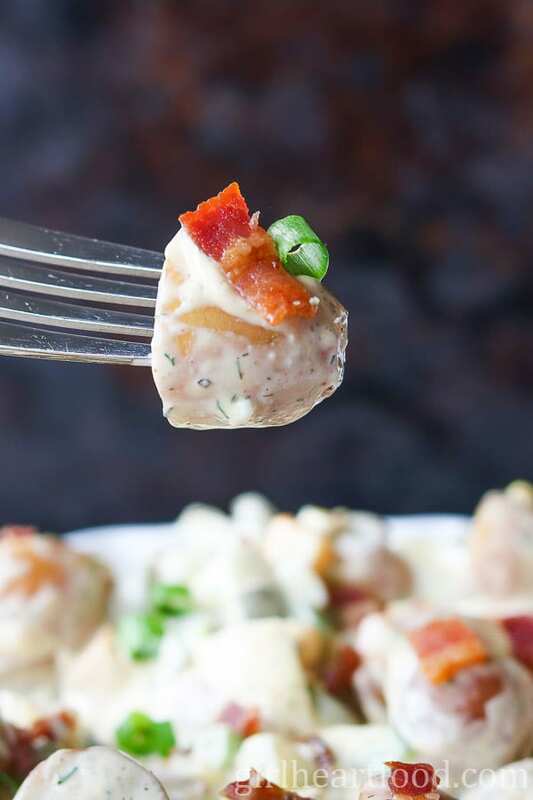 Loving this loaded potato salad! All my favourite things in one bowl 🙂 Have a great weekend! Nah….this doesn’t sound good….it sounds GREAT!!! I love the bacon and the crunchy pickle! Yummers! This would be absolutely perfect for summertime barbecues! Nicely done! Woo hoo!! Thanks so much, Kathy!! I normally avoid potato salads dressed in mayonnaise, but this version looks good! Besides, I do love the fact you used Dijon and vinegar here too. And the addition of cheese and bacon? Best potato salad indeed. Well done, Dawn! Haha – I can’t blame ya 😉 It is really tasty! Thanks Milena! Beautiful baby red potatoes, that you treat in an exquisite manner. 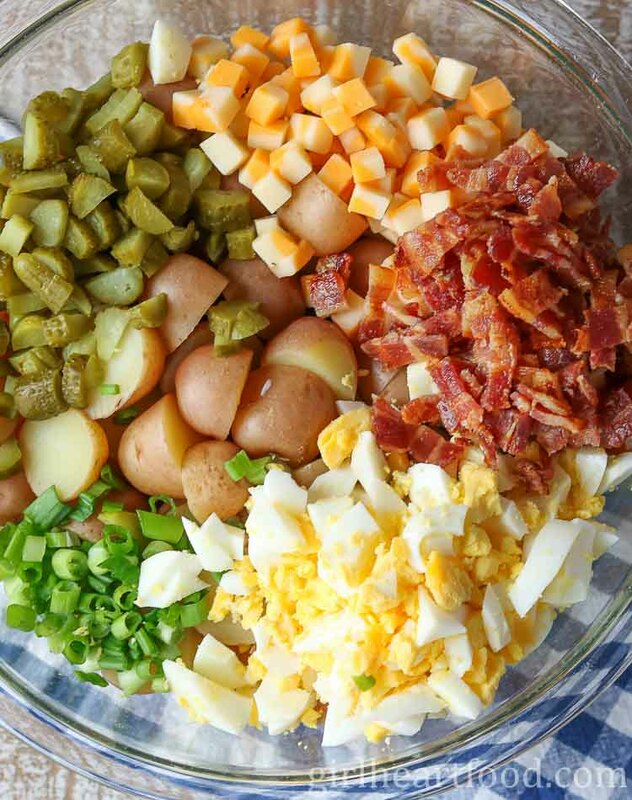 Love this salad (well, minus the bacon for me, but hubby can have it double), So many intriguing flavors, so fresh and tasty, perfect for this season! Honestly Dawn, I wish I could just grab a scoopful of this potato salad right off my screen! I love the ingredients you’ve got going on in here! Cheese, bacon, pickles…count me in! Bet it goes fast! Well, that just made my day! Thank you so much, Mary Ann!! It really does go fast 😉 Happy weekend! YES PLEASE! If you only knew how much I love potato salad. Seriously, I could make a meal out of that alone. Who am I kidding? I HAVE made a meal of it on many occasions. This looks sooo good, Dawn! And now I’m craving potatoes :). Happy weekend and happy Canada Day! Oh man, a good potato salad is one of my favorite things about summer eats! And I agree with you about using red potatoes. I don’t put eggs in my version, but I might need to rethink that now…I do love hardboiled eggs in salads. I actually have to make a batch for a family picnic next week, so I might add eggs! Oh, and one tip that I picked up recently: try putting the chopped potatoes in a steamer basket. No more threat of overboiling! Just a fun little tip. Enjoy the weekend, and happy Canada Day! Mine too!! Great tip, David! Have to try that next time 😉 You have an awesome weekend too. Thanks so much!